Have you ever been ridiculed for chasing God’s dream for your life? Have you been paralyzed by the fear of failure? Have your motives ever been brought into question and scrutinized by others, leaving you second-guessing yourself? I can’t tell you how many times I have written something only to hit “delete” because I doubted that the words I felt so inspired to type would actually make a difference in someone’s life. But because I allowed the enemy’s voice to be louder than God’s, I simply closed my laptop and went to bed. A man named Nehemiah experienced those very things, too. Yet, in spite of all the opposition, he chose to keep building anyway. I love when the Holy Spirit makes the truths of the Old Testament come alive, don’t you? That is why I’ve created this teaching series on walking in your calling. Walking in the calling God has given us is not always unicorns and cupcakes, right? Most of the time, our calling requires sacrifice and tenacity, a determination not to give up! This determination holds on to God’s promises in the midst of ridicule, fear and discouragement. After devouring this OT book, I am more determined than ever to pursue the call God has placed on my life—to encourage, equip and empower the body of Christ to live in the fullness of who it was created to be. Be the best mom you can be. Or do anything that requires leaving the pull of status quo in your life! In this study, you will learn what to do when God places a burden on your heart for something. You will uncover some of the enemy’s tactics to derail your destiny and how to stand firm against him. You will also learn how to have success in spite of anything and everything the enemy throws your way. 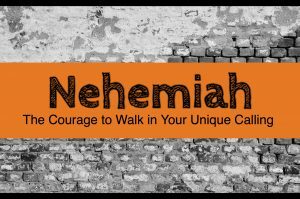 Nehemiah’s story so beautifully parallels our lives as believers walking out our own callings in the particular work God has given us to do. In researching and studying for this series, I found the book Nehemiah is most often used for lessons on leadership. 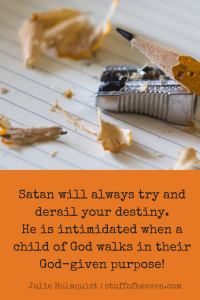 Satan will always try and derail your destiny. Click To TweetWhile it’s true that he was a great leader, there are many more layers and deeper truths to this book than you read at first glance. Nehemiah’s story is riveting! And so is yours! Go to https://stuffofheaven.com/ and sign up so you don’t miss a single teaching on the courage to walk in your unique calling. Each chapter and blog post builds upon the previous one. I can’t wait to hear how God moves you forward in the good works He prepared in advance for you to do (Ephesians 2:10). A God-sized ADVENTURE awaits you! If you know of anyone who is discouraged in doing what God’s asked them to do, is feeling like they haven’t really heard God because of the struggle, or is ready to call it quits, please consider SHARING this series with them, too.